Imagine living in a cylindrical space that traced the path of the sun, giving you maximum access to daylight and using the extra energy from targeted solar panels to power the movements of your home as well as your lights, appliances and everything else. 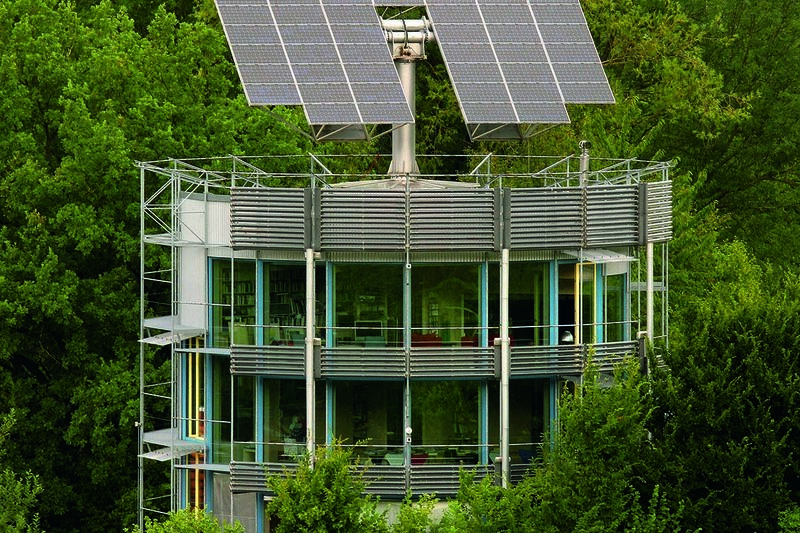 A record-breaking and award-winning design on multiple fronts, this round solar powered house remains one of the first residential buildings to generate more energy than it uses – up to six times as much per year! 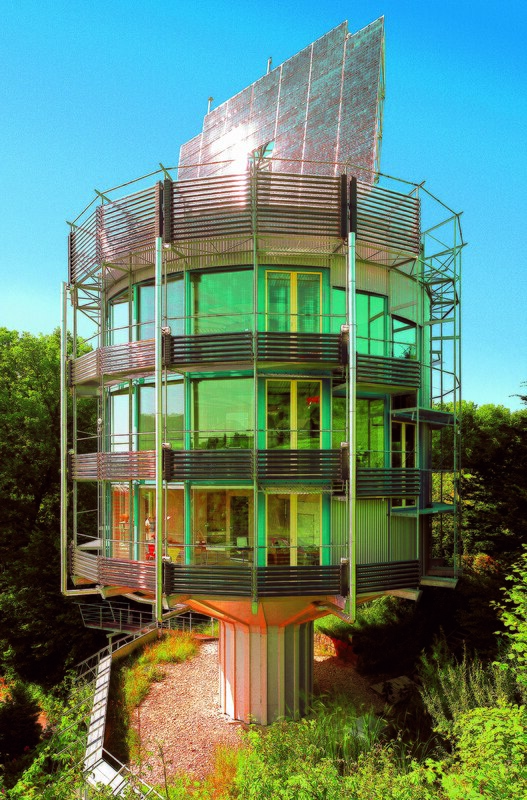 Spinning slowly on a central axis, the Heliotrope House by German architect Rolf Disch rotates to catch maximum sunlight for the solar collectors and variably exposes different sides depending upon the season. It opens up for maximum passive heating potential during the winter, and exposes a more insulated side for less heat gain during the summer. Since the original was constructed, two more models have followed – and Disch has a design in mind for yet another (much larger) version that would work as a multi-unit hotel. Three levels of glass paired with the spinning functionality give this house constantly changing views in all directions, so inhabitants will never get bored with their surroundings. 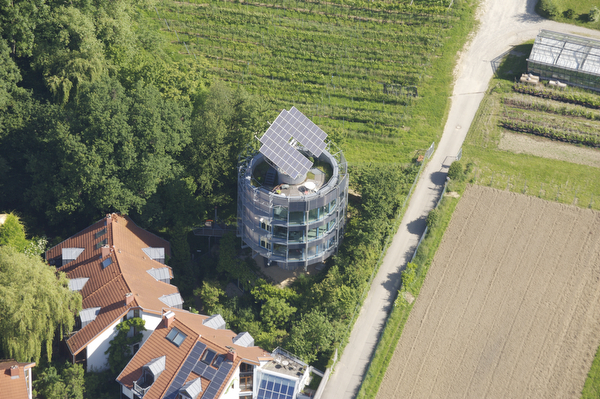 Surrounding the solar roof panels of the structure sits an open rooftop deck surrounded by railings. These supports, in turn, double as passively-heated water pipes to serve the house below. A spiral staircase runs up the middle from the entryway, passing by each rotating level in between and terminating at the top. 18 angles make up the almost-circular plan while still making use of flat materials and surfaces for ease of construction and reduced expense. Plumbing, electrical cords and other essentials are run up through the stationary central core along with the stairs. 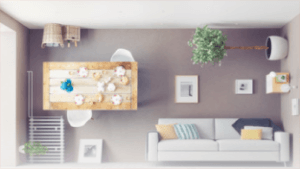 Beyond being simple, sustainable, elegant and energy-saving, this home design concept makes sense in terms of human comfort as well. 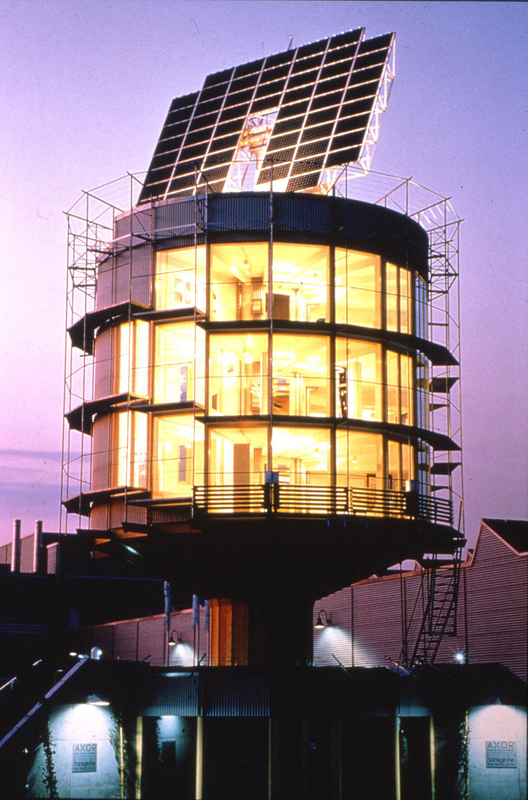 After all, controlling light throughout the course of the day is important not just to solar energy collection but also to functional daylighting needs. 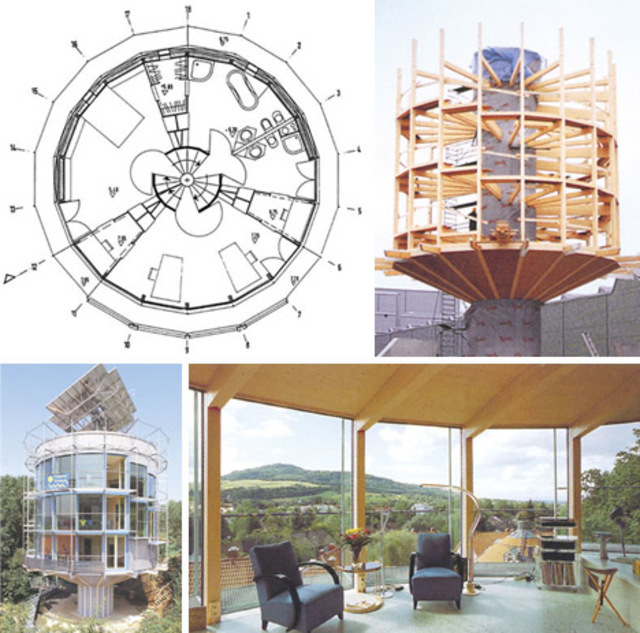 Other green strategies in this house include the essential classics of environmental design: geothermal energy, graywater reuse system and natural waste composing.